They’re seemingly everywhere—underfoot and overhead. You may find them ‘flavouring’ a stew pot or on a salad plate. Perhaps they are a topic on Jeopardy or the pattern of a favourite dress. Auction catalogues and jewellery stores, for certain. They are easy to take for granted, but essential for clean air and shade. Foliar representations may seem commonplace, but they figure prominently in ancient art and culture, elevated to a higher significance by their use. If you stop to think about it, leaf references abound in popular culture and in common speech, idioms, adages, and sayings. To “turn over a new leaf” means to rejuvenate, rebuild, or reinvent yourself or some characteristic. If you’ve ever been camping, you’ve heard the useful warning “leaflets three, let them be,” thus sparing yourself an uncomfortable encounter with poison ivy. And almost everyone is aware of the proverbial fig leaf in Adam and Eve’s Garden of Eden. Likewise, the Dove of Peace carrying a leafy olive branch. The current obsession with genealogy and the family tree offers up the popular ancestry.com, inviting a tiny, wee leaf icon, a ‘hints’ indicator, signifying related historic records are available for the lineage devotee. Branching out from there, pun intended, we have the foliate moniker of the Toronto Maple Leafs, grammatically incorrect, but for diehard fans, that’s the least of their worries. Anyone who’s ever watched a war movie has probably noticed the awarding of oak leaf clusters, which comes up at some point. Made of bronze, silver, or gold, these symbols are given to military personnel in recognition of meritorious service. Leafy, tree-laden neighbourhoods are deemed healthier for residents, and in the autumn, people drive for miles to admire the beauty of leaves changing colour. Links to the popularity of the ever-present foliate motif are easy to find in antique and modern jewellery. 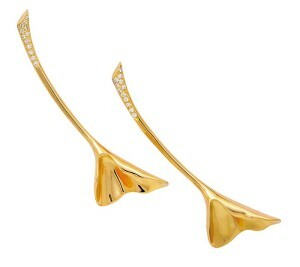 A pair of diamond and 18-karat highly polished gold Ginkgo leaf brooches by Angela Cummings for Tiffany & Co. The Queen appreciates a good foliate motif—she’s inherited a charming diamond-encrusted maple leaf brooch from her late mother and very enerously has loaned it out on occasion to Kate and Camilla. Also in the royal collection is a platinum and diamond pin in the shape of a dainty fern frond, gifted to the Queen by loyal subjects in New Zealand. And to celebrate St. Patrick’s Day, various royals have also been seen sporting a very simple yellow gold shamrock brooch by Cartier, set with a single emerald. It really elevates the idea of “wearing of the green” to new heights. Palmette motifs from the highly ornamented archeological revival period are a fanciful representation of palm leaves evoking the mysteries of ancient Egypt. Usually in yellow gold, these stylized leafy designs are seen predominantly on deeply fluted multi-drop pendants hanging from fringe necklaces and earrings, decorating wide bangle bracelets and also frequently embellishing historic diamond tiaras. Representing antiquity, Greco-Roman neo-classical designs depict laurel wreaths and acanthus motifs. 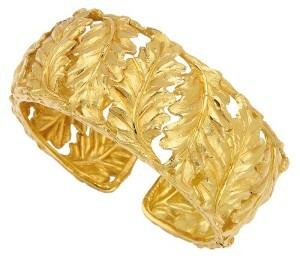 18-karat gold cuff bracelet by Buccellati decorated with textured oak leaves. On antique items, a series of intricate foliate engravings—either palmette or laurel leaf or just artistically imaginative—often decorate the edges of gold, silver, or platinum compacts, minaudieres, etuis, or cigarette and card cases. Pocket watch fobs and seals from the Georgian era and art nouveau lapel watches frequently bear leafy elements. Tiffany & Co., silversmiths designed tea and coffee services in the 1860s with elaborate repoussé and chased leaf motifs ornamenting the body, footed base, and finials. Entwining grape leaves were a popular feature on household items. Such details contribute so much to the beauty of utilitarian items. A truly admirable diamond brooch set in platinum and yellow gold, circa 1895, elegantly dangles seven ivy leaves on a curving knife-edge stem. It sparkles with mine-cuts accented by rose-cuts. The genius of one of Faberge’s breathtaking eggs, a one-of-a kind treasure, lies in its realism. Dotted with rubies and diamonds, it is formed out of wirework green enamel three-leaf clovers, dates from 1902, and according to legend, is too fragile to travel out of Russia for exhibit elsewhere. Tutti frutti pieces effectively depict carved emerald, ruby, and sapphire leaves as a dominant part of the overall design. Inspired by historic Moghul jewels, Cartier designers are extraordinarily adept at blending the modern with the traditional in their extensive use of this eye-catching concept, especially on wide strap bracelets. The Gingko species has been determined by botanists to be the most ancient type of tree on earth and the distinctive symbol is recognized as the maker’s mark for prominent West Coast designer Karl Stittgen. 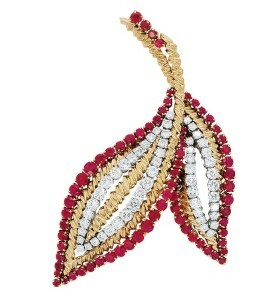 The fan-shaped, bi-lobed leaves were also an inspiration for Angela Cummings when she designed an 18-karat gold pair of elegantly sweeping brooches for Tiffany & Co.
Van Cleef & Arpels’ bountiful leaf series includes myriad brooches, many with mystery settings, those intriguing invisible mountings decorated with rubies, sapphires, or emeralds, stylized versions of what could be ivy, oak, maple, rose, or grape leaves. Maybe not exactly botanically correct, but nonetheless beautiful in their form and exquisite in technical mastery and superb craftsmanship. A claw-set diamond, ruby, and 18-karat gold leaf brooch by Van Cleef & Arpels. Georg Jensen designers are admirably noted for their use of natural inspiration. Leaf motifs enhance bracelets, rings, necklaces, and cufflinks; useful everyday items like fruit bowls, bookmarks, letter openers, table clocks, and candlesticks benefit from the sinuous or edgier lines executed mostly in sterling silver. The master goldsmiths at Buccellati use leaf motifs on many of their signature bangles, including a wide openwork cuff bracelet boldly decorated with curving oak leaves in 18-karat gold. Even the skeletonized outline of a leaf can be lovely when it’s made of delicate openwork tracery, tiny round diamonds decorating white gold outlines and done with finesse by an unknown jeweller. Designers will continue to find inspiration in the endless variety of beautiful leaf shapes. 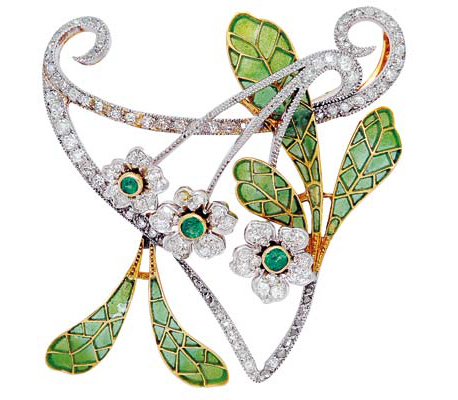 Take a ‘leaf’ out of their jewellery design book to enjoy the many pleasures of great foliate motifs.